After almost a year of agonizing posturing by Sony, the semi-flexible 13.3-inch Digital Paper has finally been unveiled. For $1100, you can get your hands on the thinnest, lightest A4-sized e-ink tablet. The Digital Paper supports stylus input, has built-in WiFi, and lasts up to three weeks on a single charge. The key technology here is the new Mobius display from E Ink, which is very light and highly flexible though it isn’t clear how much of that flexibility made it into the final Digital Paper product. When it comes to displays, the problem as far as weight and flexibility are concerned has always been the substrate. The liquid crystals, the organic diodes, the capsules of ink, the transistors, the wiring all of the key display stuff is already light and flexible. But you have to build all of that stuff on something heat-resistant and transparent i.e. glass. Glass is heavy (especially at larger sizes), and it’s very brittle (especially when it’s thin, which is necessitated by weight constraints). Glass is a terrible display substrate, basically, but sadly there hasn’t been another option. Until now. 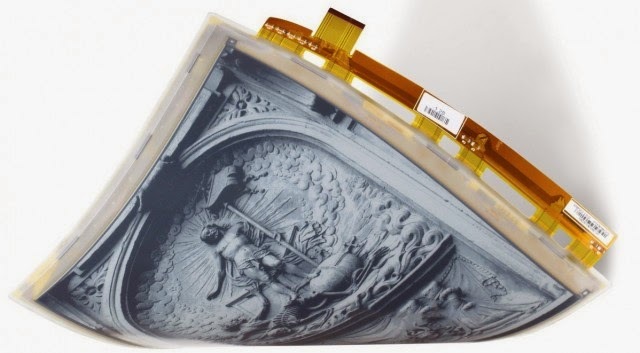 In the last few years, thanks to the development of new materials and low-temperature manufacturing techniques, it’s now possible to build displays with plastic substrates. These plastic displays are cheaper, lighter, and flexible (and thus more resistant to certain kinds of damage, too). Enter E Ink Mobius, which is basically the same e-ink tech as Pearl or Carta (found in various Kindles and other e-book readers), but on a flexible substrate. The E Ink website says that the Mobius display is 13.3 inches on the diagonal (i.e. the size of a piece of A4 or letter paper), with a resolution of 1600×1200 and the ability to show 16 levels of grayscale.. When we first saw the technology back in May 2013, Sony helpfully had some of the Mobius displays outside of their chassis, so that you could marvel at their flexibility. Unfortunately, for the commercialized version of Digital Paper, there is once again a plastic bezel around the outside of the display. The Digital Paper website says nothing about flexibility, but in the video you can see some Digital Paper prototypes that appear to be at least semi-flexible, or not entirely rigid. In all likelihood, Digital Paper will probably flex a lot more than your iPad, and it will probably survive if you sit on it, or drop a book on it but you can’t roll it up. That’s the next step, when we commercialize flexible batteries and circuitry. 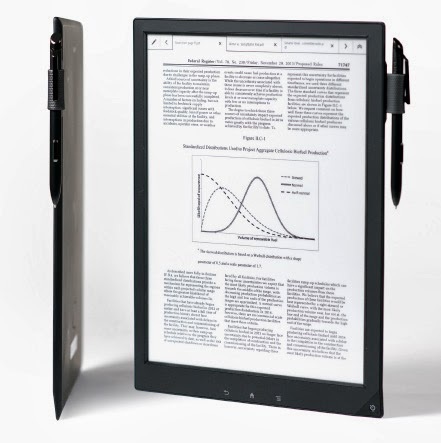 At $1100 (shipping in May), Digital Paper is being pitched at education, business, and legal environments. Digital Paper appears to only support PDFs, but the website implies that software is included to convert Word, Excel, and PowerPoint files to PDF format. Stylus input appears to be accurate and high-resolution, though e-ink’s refresh latency might cause you some mental discomfort. 4GB of internal storage and a micro SD slot should give you plenty of space for annotating textbooks and documents. At just 357 grams (12.6 ounces), Digital Paper is by far the lightest large-screen tablet on the market, too (the iPad Air is a chunky 469 grams). Hopefully this is the beginning of an exciting, flexible-and-light-weight computing revolution!